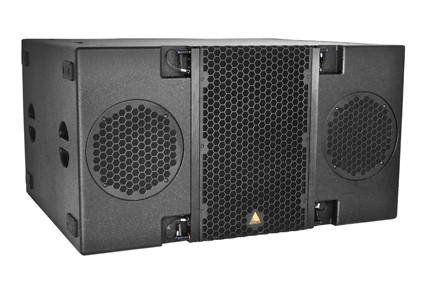 The E218 subwoofer was developed to pair with the E12 or E15 enclosures. Two light-weight, long excursion ND18-S Kevlar Neodymium drivers which utilize Adamson’s Advanced Cone Architecture are mounted in an efficient band-pass subwoofer. The design achieves a remarkable reduction of the rearward radiated energy without dedicated cardioid setups and algorithms. A typical user would appreciate the sonic attack of this design. The E218 can be used ground stacked or flown utilizing the E-Frame Full Line Adapter. The frame also allows the E218, E219 and E12/E15 enclosures to be flown in the same array. The E218 is constructed of (marine) birch plywood as well as aircraft grade steel and aluminum and is equipped with three Speakon NL8 connectors, two parallel in / out plugs and one dedicated output connection point for efficient cable usage. The integrated rigging system allows for either 0° or 3° splay between adjacent enclosures.